A photo that I took at the festival. This semester is as intense as it could be! I know you heard me saying this so many times, but it is a lot of work! As soon as the semester started, I was busy right away. 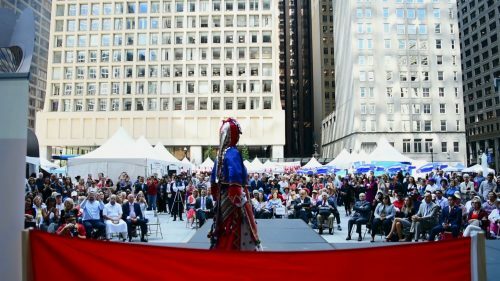 When I arrived back in Chicago after my summer holiday in Turkey, there was the 15th Annual Chicago Turkish Festival in 2 weeks. I volunteered to be the photographer and videographer for the festival. 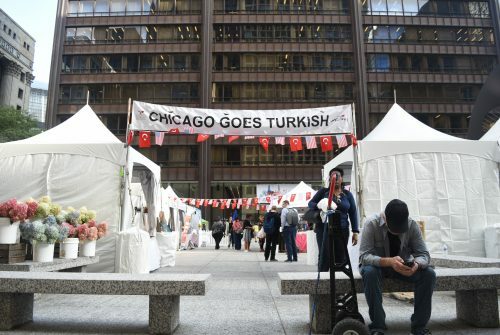 It was in 3 days, right in front of Daley Plaza, and the majority of the artists that would be at the festival came from Turkey. It was great to be a part of an event like this. Not just because it was Turkish festival, but also I was able to gain experience taking photos and shooting videos ! I made a video, too. It took some time to make it, but I was able to finish it and actually screen it during the brunch that the Turkish American Cultural Alliances gave to the all volunteers. Dancers on the stage at Chicago Turkish Festival. A frame from the video that I made for the festival. A photo of the entrance of the festival. Besides the festival, my thesis development is going well. I am having meetings with my producer and my friend, Urwa, almost every week to talk about the script and how we can try to make it better. We bounce ideas off each other and do as much brainstorming as we can. My classmate and friend Neva is the writer; she joins our meetings too. I am enjoying the collaboration process. Everyone is in my class is thinking their projects and giving feedback to me in our thesis workshop class. I am in love with my elective class, Digital Cinema Mastering. You wouldn’t think that there would be so much to learn about post-production, but thanks to our great professor Dennis Keeling, we never stop learning! We started doing the creative edit of a short film that was already shot for this class a couple of years ago, so after we completed the creative edit, we did the coloring for that film too. I am so happy to know what the scopes mean now and how to use them. This week’s assignment is to actually put our cuts on a tape that is given to us by Columbia College Chicago. We are going to be watching our cuts and our tapes next week! The next assignment in the class is to find a student project and do the online session of the film, so we are all looking for a film to finish! For student projects, it is a common thing to actually not finish the film, so this class is a great opportunity for us as colorists and also for other students who have films that are waiting to be finished. Other than that, we came to the end of our 5-week Cinema Studies 3 class, which was about cinema and neuroscience. We are expected to write a 7-9 page paper, so I need to go and complete that now.